Plumbing issues can be difficult to detect outside of professional maintenance appointments, since the system they’re affecting is mostly out of sight. Even if you schedule preventive maintenance for your plumbing system on a regular basis, though, you still need to keep an eye out for signs that there are problems developing between appointments. Have a look at the issues below to help determine whether or not your plumbing system is in trouble. If your water pressure is dropping low enough that you can actually tell, it’s a sign that you should call for repairs as soon as possible. There are a lot of different possible reasons why your water pressure might be dropping. Leaks of sufficient size can divert enough water that it manifests as a pressure drop at the faucet. If that’s the case, it’s more of a plumbing emergency than a normal problem due to the amount of damage that much water can do in a short amount of time. It’s also possible that you have limescale building up in the pipes, which would restrict the flow of water through the system. The more the limescale builds in the system, the more it will choke off the water flow. If you suspect that this is the reason that your water pressure is falling, you should make sure that you call for professional repairs before the limescale hardens and requires repiping to fix. Some leaks are too small to actually give off recognizable symptoms. They have to be physically spotted either by the homeowner or during an inspection appointment. 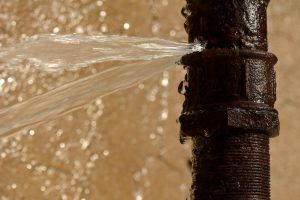 While these pinhole leaks may not be large enough to drop your water pressure in ways you’ll notice, they can certainly drive up your monthly water bills. You should keep a close eye on your water bills, and call for repairs if you happen to notice that yours are getting higher than you think is justified by the amount you’re using. If your bills start to rise quickly, it might be because you have a number of smaller leaks that need to be patched. As is the case with many other kinds of home problems, fast response is key for addressing plumbing issues. If you aren’t sure whether or not your plumbing system is actually dealing with a problem, but you suspect that something is wrong, we highly recommend that you call a professional to take a look at it for you. It may be nothing, or it may be a serious issue that you have to deal with as soon as possible. Better to be safe and have it checked than to ignore it and have to pay a high repair cost later on. Tuckers Air Conditioning, Heating & Plumbing provides comprehensive plumbing services. If you’re looking for the best plumber in Gaithersburg, MD, we are here for you. Contact us today to schedule an appointment with one of our professional plumbers. We’ll make sure that your plumbing system stays in good shape, no matter what.